Leftover coffee plus Jello equals this vintage dessert. Until recently, the old Boston dessert of coffee gelatin seemed to have had its day in the U.S.A. The simple combination of coffee, gelatin, and sugar was popular during the early 20th century, when Jello’s reign over American cuisine began. (Although versions of the treat can be traced back to 19th century Europe.) But by the 21st century, it had largely faded from the menus and memories of New Englanders. “Coffee Jello was exactly what it sounds like—brown gelatin with a coffee flavor—it was a great dessert, especially with a dollop with whipped cream,” Roger Berkowitz, the CEO of the Boston-based Legal Sea Foods chain of restaurants, said in a 2016 interview. Its dwindling popularity may be due to its reputation as “a poor person’s dessert,” as the The Oxford Encyclopedia of American Food and Drink puts it. Gelatin is cheap, as is leftover coffee. The massively influential Boston Cooking-School Cookbook, published in 1896 by Fannie Farmer, gave the terse list of ingredients for “coffee jelly”: gelatin, sugar, boiled coffee and water, served with cream and yet more sugar. The most famous purveyor of traditional coffee gelatin today is Boston’s Durgin-Park restaurant, which has been operating since 1827 in the city’s Faneuil Hall. The restaurant is one of the few to serve up facsimiles of vintage New England Yankee foods, such as baked beans, Indian pudding, and “Coffee Jello” made from the restaurant’s day-old coffee. 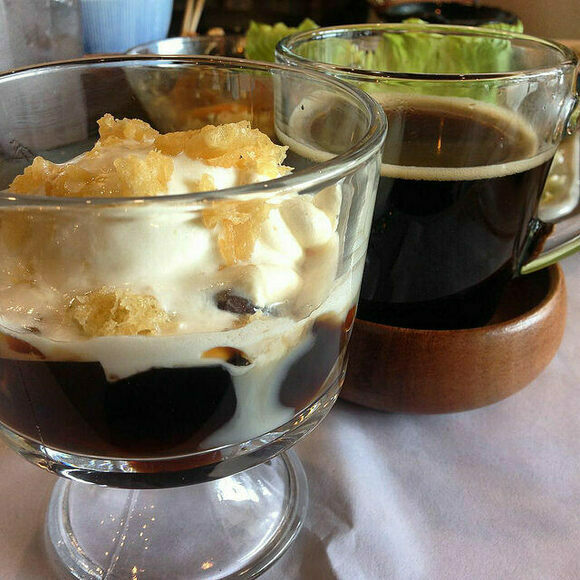 In Japan, coffee gelatin has enjoyed more continuous popularity. One account posits that Yomiuri Shimbum, a Japanese newspaper, first published the recipe in 1914, provided by a student who studied home economics in America. In the 1960s, coffee jelly was made popular once more when it was sold by the Mikado Coffee chain. More recently, in 2016, Starbucks offered a coffee jelly Frappuccino in Japan, and coffee gelatin is still sold in convenience and grocery stores in portable plastic cups. But coffee gelatin may be staging a comeback in the U.S. as well. In July 2016, Berkowitz lamented that whenever he brought up the coffee jello dessert of his childhood, he saw only raised eyebrows. He offered a prize to whoever could send him a great recipe. By September of that year, it was back on the Legal Sea Foods menu, albeit for a limited time. Coffee gelatin can be sampled at Boston's Durgin-Park restaurant, where it's never gone out of style. Some people like to stir in cream, as coffee gelatin is often served less sweet than you might expect. In Japan, a similar dessert is easier to find, although not ubiquitous. Durgin-Park is a vintage eatery with an emphasis on old-time Boston cuisine.